VITA North America helps create the perfect match between denturists and lab technicians, inspiring them to deliver the most esthetic, functional restorations to patients. We accomplish this by providing unparalleled shade technology, quality products and services that help deliver accurate color reproduction with superior clinical and financial results. The system solution for precise, efficient and true-to-shade zirconia reconstructions. VITA YZ® SOLUTIONS makes it possible to have a precise and accurate shade production of fully/partially veneered and monolithic restorations. 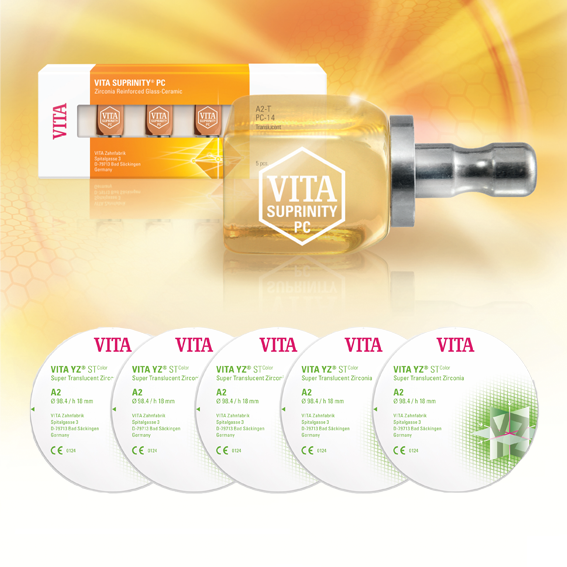 Introducing VITA SUPRINITY® PC a partially crystallized, zirconia-reinforced block that is strong without compromising esthetics. With strength of 541 MPa, VITA SUPRINITY® PC features a fine-grained and homogeneous structure, which guarantees excellent material quality and outstanding processing characteristics for fast milling and polishing.